If you are looking for some new workwear, and don’t fancy paying top end prices, then JCB offers a value for money range of essentials that will kit you out from head to foot. Anyone who knows about staying warm in hostile climates will tell you it is all about layers. Each layer performs a specific task in keeping you warm but also moving moisture from your skin to the outside world (lucky outside world). The JCB Base layer bottoms are what we used to call ‘Long Johns’ when my grandad wore them but these sleek lightweight, stretchable base layer legs borrow technology from sportswear. They are wicking, and quick drying, and have a permanent odour absorbing ingredient. Somewhat strangely they have a UV blocking factor of 50+. The idea of wearing them to block out harmful UV had never occured to me. 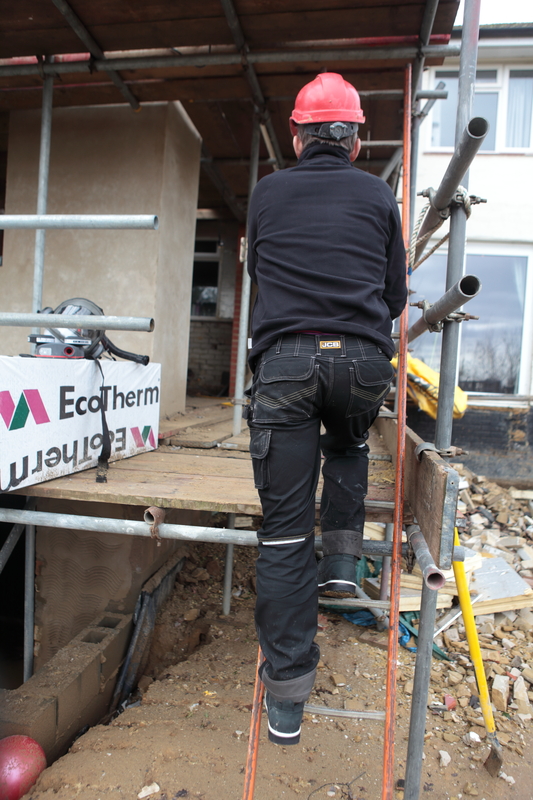 The JCB Base layer top has long sleeves and the same properties as the bottoms – namely wicking and anti-bacterial. The Mid Layer Micro Fleece is lightweight, and full length, so it covers your midrif. Often the weak point in lower priced clothing is the zip, but JCB uses YKK zips, which are the market leaders. The double thick funnel neck collar will zip right up under your chin, keeping you warmly tucked in. The Trade Puffa jacket with hood is a top layer jacket that is showerproof and very lightweight. In truth it is a little too light to be worn for heavy work but if you are wearing it under a hi vis vest it will work very well. It certainly won’t slow you down. It is amazing how a good pair of socks can improve the comfort of shoes and boots and JCB also has socks. Some people think that socks are just socks but when you look at what goes into a good pair of work socks it is easy to see the difference. 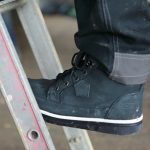 When you wear them you will feel the cushioning effect and the abrasion resistant sections that will help protect your feet from blisters and sore spots. This JCB marl knit beanie is a very attractive winter hat but when you look on the inside you will notice it is, in fact, double skinned. 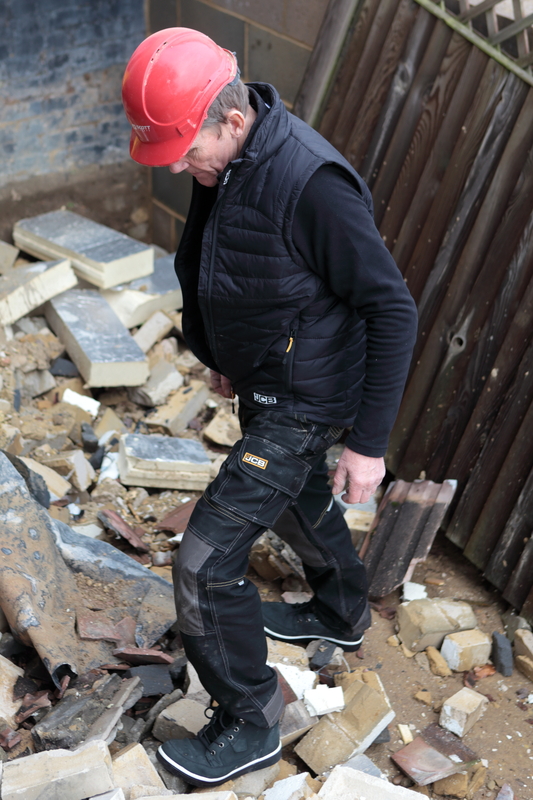 If you are looking for jeans style work trousers without holster pockets these JCB Cheadle trousers have adjustable knee pad pockets and triple stitching They have a waterproof knee pad pocket and a waterproof anti wicking rear hem. They are made from a heavyweight fabric of polyester and cotton which is probably better suited to the winter. JCB also had shoes and boots in the range and these are a cut above many of the budget priced boots you see. I would not claim they are amazingly comfortable but they are good for the money and very stylish. Click here for more reviews from Roger and Tibby.